On November 1, a letter condemning antisemitism will run as an advertisement in the Pittsburgh-Post Gazette. Coordinated by the Western State Center and signed by representatives of 130 organizations, the letter condemns the recent massacre at the Tree of Life synagogue and blames increasing violence on the rhetoric of politicians. 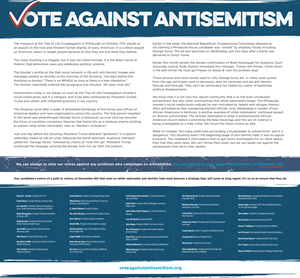 The signatories call on voters to reject antisemitism through the ballot box, concluding, "We can pledge to raise our voices against any politician who campaigns on antisemitism. We can commit to vote against antisemitism on November 6th." It is welcome to see such a diverse array of organizations — from all manner of minority advocacy groups — take a stand against such violent extremism. But it is deeply alarming to see that a number of the signatories have in fact previously promoted antisemitism themselves. One of the supporting organizations, the ICNA Council for Social Justice (ICNA-CSJ), is an arm of the Islamic Circle of North America, a group tied closely to the violent and antisemitic South Asian Islamist movement Jamaat-e-Islami. 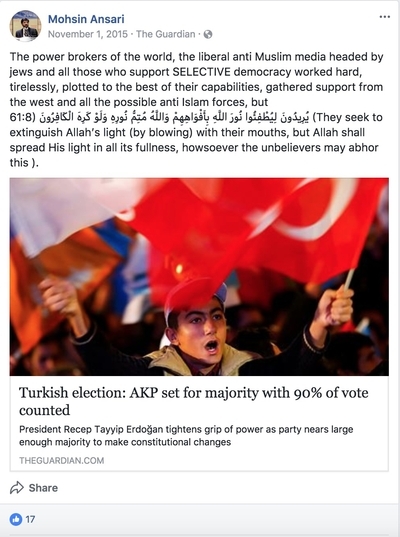 ICNA-CSJ board member Mohsin Ansari has written of his pleasure that the Islamist party in Turkey is in power, despite the "power brokers of the world, the liberal anti Muslim media headed by Jews." ICNA-CSJ is also a prominent supporter of Aafia Siddiqui, a jailed Al Qaeda operative who blamed her prosecution on a Jewish conspiracy and insisted that no Jews be allowed to serve on the jury. Other signatories include more than a dozen branches of the Council on American-Islamic Relations (CAIR). Signatory Zohra Lasania, Program Director of CAIR's Pittsburgh branch, has been quoted generously in the media over the last few days, in which she condemned the Pittsburgh killings and offered "solidarity with the Jewish community during this time of shock and grief." On social media, however, Lasania is much less friendly toward Jews. She promotes and endorses the antisemitic statements of Ken O'Keefe, a prominent Holocaust denier, whom the Southern Poverty Law Center has condemned because of his overt antisemitism and support for white supremacy. In response to O'Keefe's claims that American intervention in the Middle East is part of the "greater Israel project," Al Qaeda is run by the CIA, and "American sons and daughters" are dying for "Zionist wars," Lasania wrote, "truth spoken." Then there's Hussam Ayloush, who runs CAIR's Los Angeles branch. Ayloush was widely criticized earlier this year after he claimed that "Jewish American kids" who joined the Israeli armed forces were responsible for war crimes. He further suggested these American Jews should be investigated by the government through counter-extremism programs. And it's important we do not leave out Nihad Awad, the National Executive Director of CAIR's head office, and another signatory to the letter. Awad has a history of peddling conspiracy theories that the US Congress is controlled by Israel. At a 1998 lecture at Georgetown University, Awad told the audience that US policy is "driven in part by the Jewish origin of many Clinton administration officials. … Who of Clinton's advisers … is opposing the latest agreement with Iraq? Look at their names. Look at … their ethnic or religious or racial background. You will see that these are the same groups that belong to the same interest groups in the administration." Further, as the Investigative Project on Terrorism uncovered, when Awad previously worked for the (now defunct) group the Islamic Association for Palestine (IAP), the organization distributed a pamphlet (stamped with their logo) called "America's Greatest Enemy: The Jew! And an Unholy Alliance!" The Western State Center and other signatories to the Pittsburgh letter claim to be concerned with those who lend a "loudspeaker to antisemitism." But what about those, standing much closer, who spew it directly and with impunity?